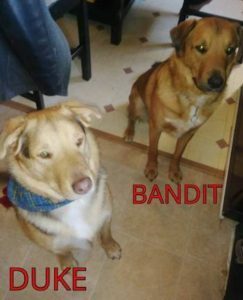 Additional Notes: MALE: Shepherd/ Lab mix, 1 year old, tan coat with some black shading and white on chest, wearing a red collar. NAME: Duke MALE: Lab/ AmStaff mix, 2 years old, tan coat with white blaze on chest, wearing a chain collar. Name: Bandit. Both went missing on April 8/19.